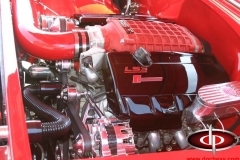 D&P recommended a new GM Performance LS3 with a 4 speed automatic GM transmission with overdrive. During construction Dave asked about adding a little more horsepower. 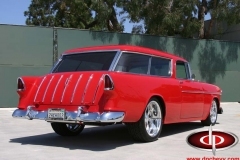 Darryl @ D&P suggested a Magnuson supercharger that would add some 135 horsepower to the modern Nomad. 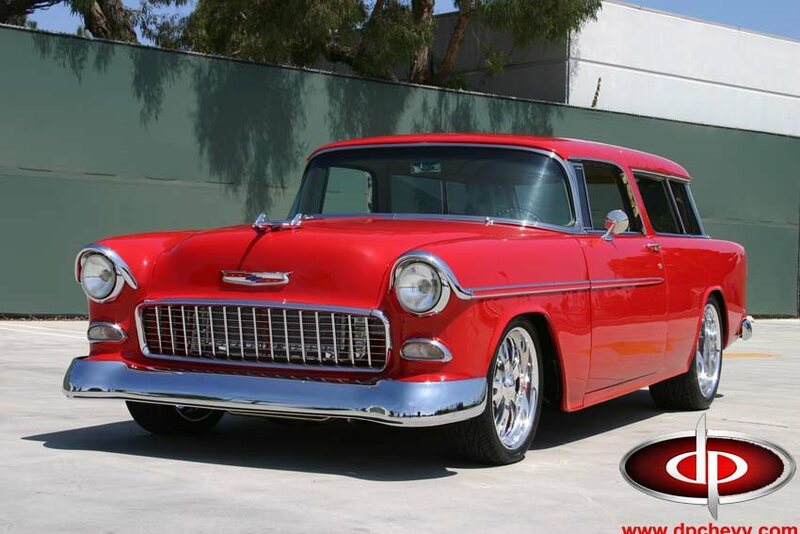 Dave agreed and soon D&P was installing unit #1 of a special edition red supercharger built by Magnuson. 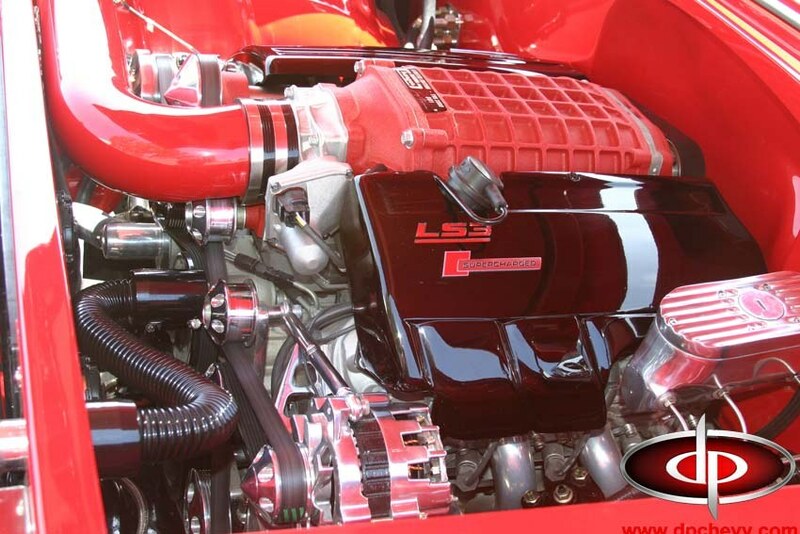 D&P used a Street and Performance Serpentine pulley system on the blown LS3. 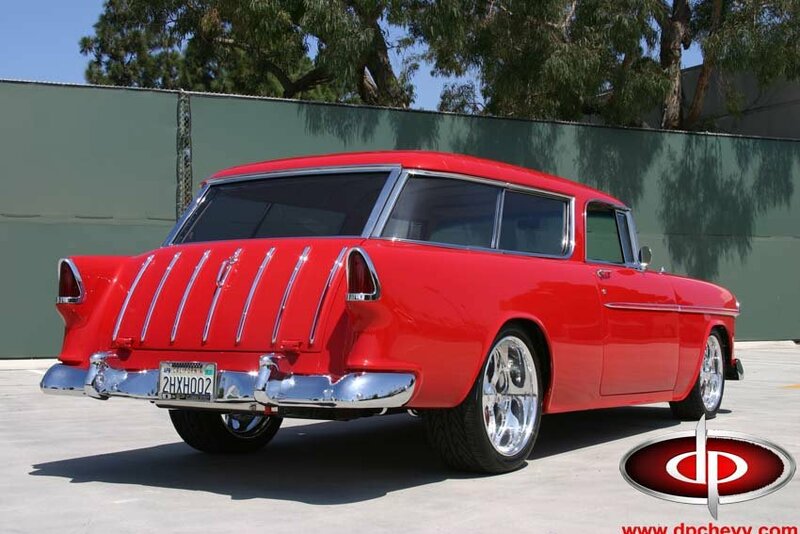 During the body off the frame restoration every part of the Nomad was either restored, updated, or replaced. 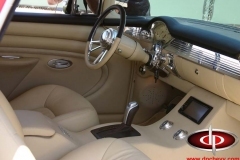 The front suspension was updated with a 500 series power steering box with an Ididit Steering Column. Global West upper and lower control arms were used. 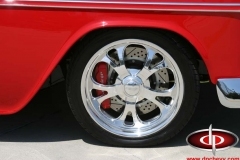 The rear suspension was a parallel leaf spring system with mono leafs and tractin bars and a Currie Enterprises 9 inch Ford differential. The Nomad was painted with PPG paint in “brilliant red.” Many of the trim items were replaced with parts manufactured by Danchuk. The cooling needs were handled by a D&P designed aluminum cross flow radiator. 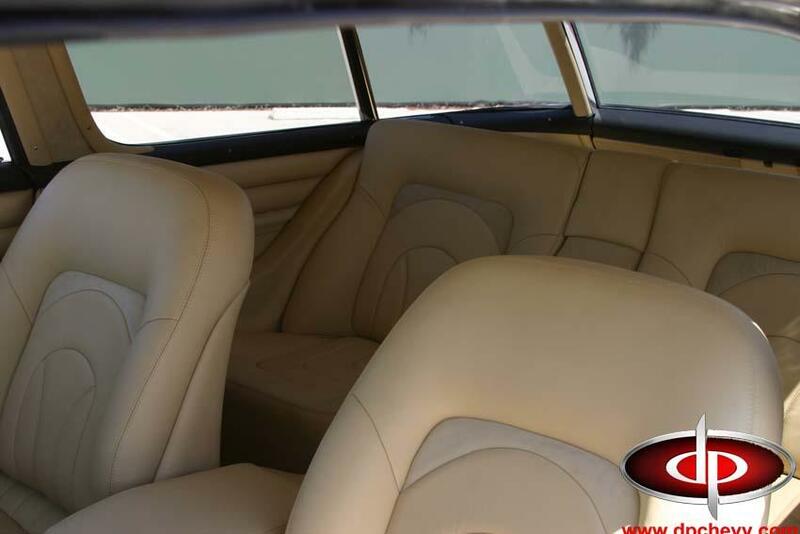 There are numerous creature comforts including power windows, power vents, vintage air conditioning, power seats, Pioneer stereo with amps, subs and numberous speakers throughout, tilt steering column, 6 piston Baer brakes with drilled and slotted rotors, Raingear Wiper system, and much more. 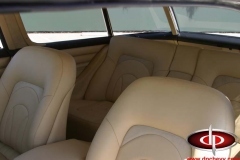 The impressive modern leather interior was designed and installed by Revo and the crew at Stitchcraft interior. 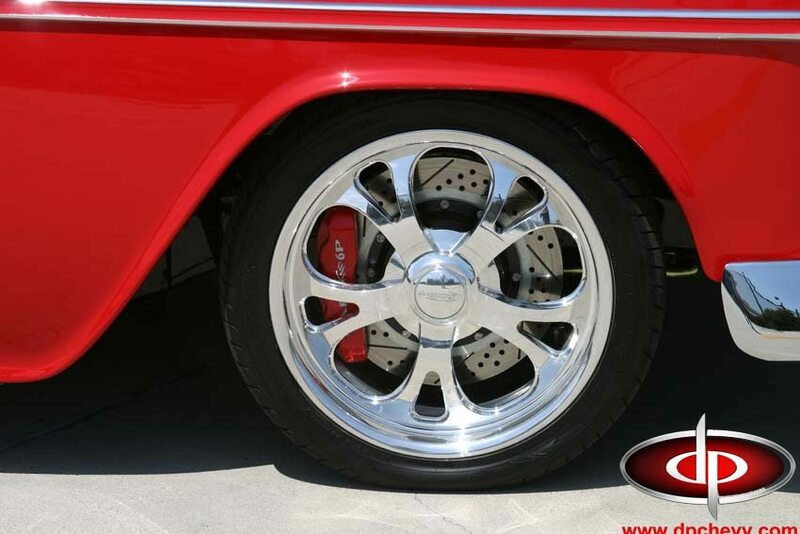 The custom wheels were built by Schott wheels. The stainless steel gas tank with pump was built for D&P by Ricks Hot Rods. In the short few months since completion Dave and Donna have logged over 2000 miles on their “new” Nomad. This car was built to be driven not trailered and they have driven it as far as Laughlin, Nevada for a car show. The Nomad has won numerous awards since completion. 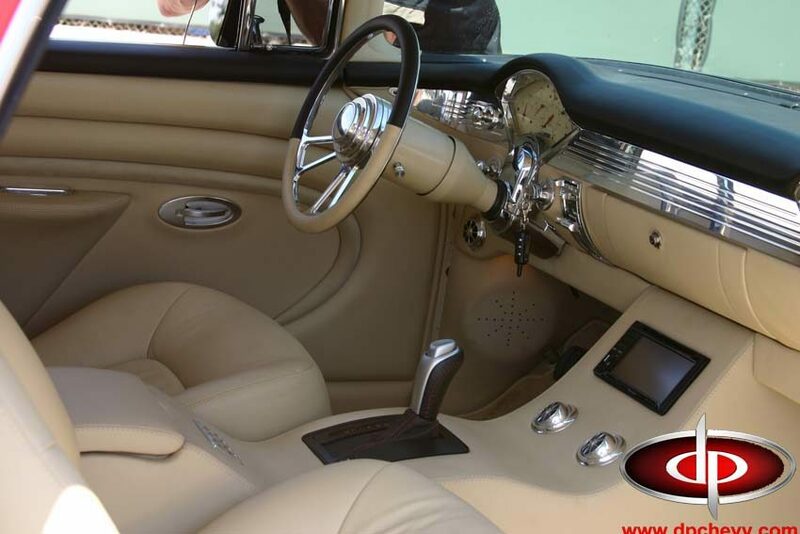 Dave and Donna are enjoying their Nomad and reliving the old days once again. 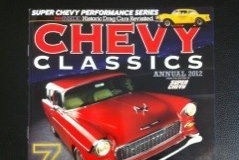 The Cook’s Nomad was selected for the cover of the annual 2012 “Chevy Classics” publication that is currently on the newsstand. 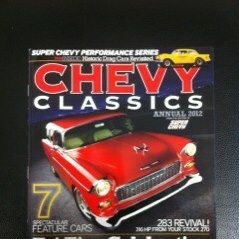 This magazine is published by Super Chevy and specializes in Tri-Five Chevy vehicles.